Björk's stage show may give the appearance of something that is elegantly simple, but it also provides its audience with a stunning visual and aural experience, making use of a bizarre collection of unusual and custom-made instruments, a 24-piece all-female Icelandic choir and a virtuoso instrumentalist triggering samples with an electronic drum kit and playing a MIDI xylophone. Matt is also a performer in the show, processing the drums in real-time and using his small selection of MIDI control surfaces and keyboards to play some of the weird and wonderful instruments that decorate the stage. "There's me, the choir, Björk, a percussionist and drummer called Manu Delago and a bunch of MIDI instruments,” explains Matt. "Manu is primarily a hang-drum player, but he can play everything. He has an electronic V-Drum kit and a Xylosynth, which is like a MIDI xylophone, so he can play pitched stuff on it and also frequently plays both the Xylosynth and drum kit at the same time! "There are two different shows. There is one that's in the round, so the audience is all around and it is more of a theatre piece, but for the festival shows it's more of a classic front-on gig, so we don't have the circle of screens. And the choir numbers vary between 12 and 24, depending on the nature of the gig and venue. "A lot of things, like strings and brass, have been replaced by the choir so I've done choir arrangements for Björk's back catalogue material. All the other bits and bobs come from me and Manu and a selection of mechanical instruments that she has had made for this project. 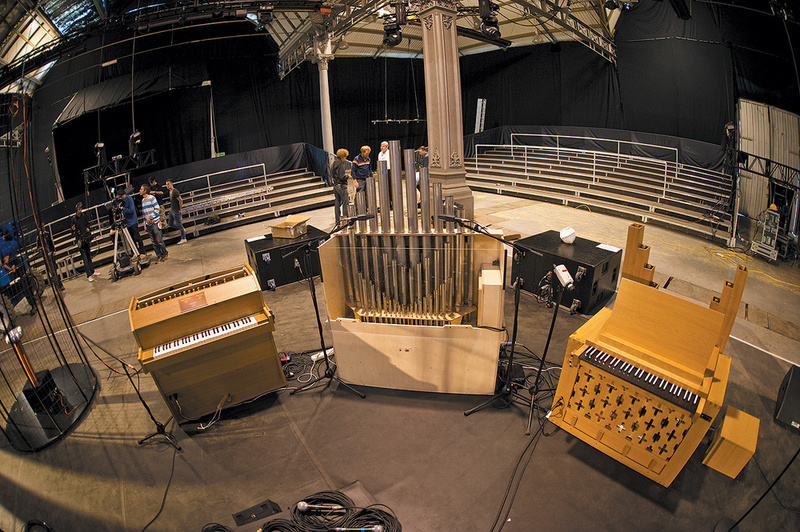 Björk wanted to be able to control a bunch of acoustic instruments with custom bits of software that were written for iPads, JazzMutant Lemurs and various touchscreen devices, so she got a guy called Björgvin Tómasson to customise a couple of pipe organs for her. They are exactly the same as chamber pipe organs that you might find in a little church, but they have MIDI controlled solenoids under the keys Photo: Paige Parsons so it means you can control them from sequencer applications and anything that chucks out MIDI. "Then she had someone called Damian Taylor write her a bunch of Max MSP patches that worked in a similar way to the pseudo-generative iPad apps, like Brian Eno's Bloom, but these are much more controllable, and they allow her to control the MIDI acoustic instruments. Damian designed a lot of the software that was used in the production of the Biophilia record. "So there are the two pipe organs, and then four huge pendulum harps, which she also had custom made. The pendulums are on one corner of the stage and pipe organs are on the other and then there's a celeste that has had all the insides taken out and replaced with gamelan bars. There is a London-based guy called Matt Nolan who makes strange cymbals and gamelan orchestras, and he put together the innards along with Björgvin Tómasson. It's basically a chromatic MIDI gamelan inside a celeste case. We've called it a Gameleste, which seemed to be the most elegant conjunction of the two words. Perhaps the most stunning instrument in the setup is a huge Tesla coil lightning machine, which is suspended above the stage for all to see. The instrument is triggered by Matt, who plays it from one of his controller keyboards, using Ableton Live to provide the correct input signals. "The Tesla coil is both a visual and a sonic thing and it is really loud,” explains Matt. "It is by far the loudest thing on stage and we very rarely need to mic it up. It's basically a big lightning machine which oscillates at whatever frequency sine wave you play into it. So it arcs and creates these lightning bolts 500 times a second, and plays a Bb or whatever note it is. It's a really vicious noise and doesn't really sound like anything else. "There is a little control box that you can play a sine wave into and that makes it arc. I usually use the Analogue plug-in in Ableton. It's just a basic synth but you can set it to output a sine pattern, and then whatever notes you play on the keyboard, it plays a sine wave at that pitch. The custom-made pendulum harps, designed by Björk's friend Andy Cavatorta, Matt Robertson on stage in Tokyo.Photo: Chikashi Suzuki may not light up like the Tesla coil, but in their own way they are just as impressive. Each of the two huge wooden structures has a pair of pendulum arms, and at the end of the arms are a set of harp strings which are plucked by plectrums as they swing. "Björk wanted to create an instrument that used gravity to create music,” says Matt, "so Andy came up with these massively elaborate 30-foot, 18-arm harps that would swing back and forth, and each time they passed through the centre point, they would pluck a note. That design got condensed down to what we have now, which is four swinging pendulum arms, but the bits hanging on the bottom of the arms have many harp strings. Every time it swings through the middle point, one of those strings hits a plectrum, then as it swings back that whole contraption rotates by one string, which means it plays a different note. Matt's association with Björk began when he was asked to arrange her back catalogue of songs for a brass band playing on her previous tour, promoting the Volta album. 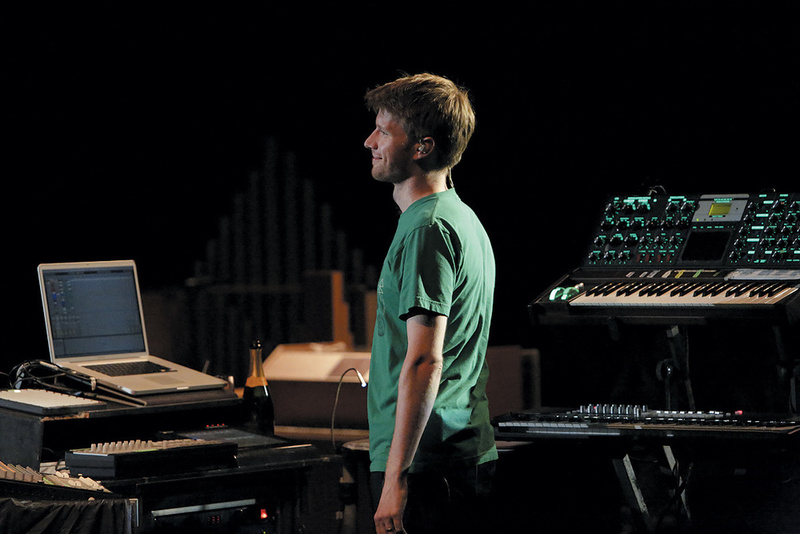 Having been recommended to Björk by Damian Taylor, who he had worked with on a number of projects, Matt spent six weeks in pre-production working through the old material with Björk and the brass players, until everyone was happy with the arrangements. 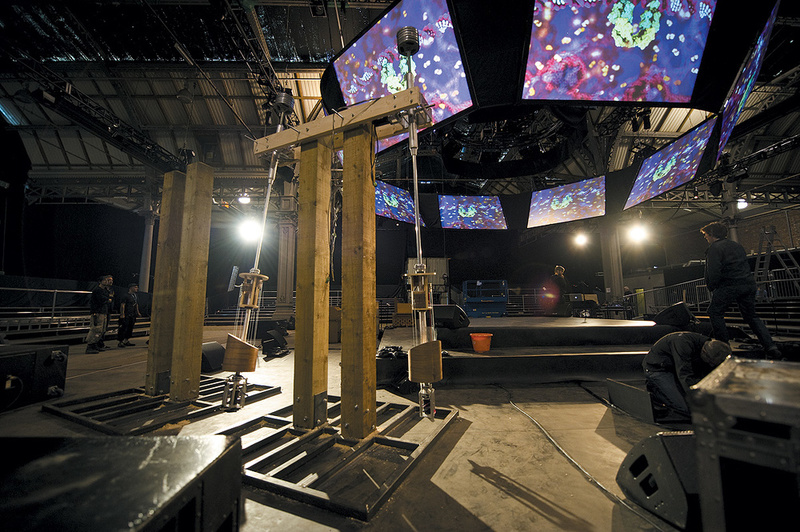 For the Biophilia tour, which began in 2011, the brass band had been replaced by a 24-voice Icelandic female choir called Graduale Nobili, and new arrangements Björk's 30-foot pendulum harps are controlled via MIDI by servo motors.Photo: Carston Windhorst had to be written. 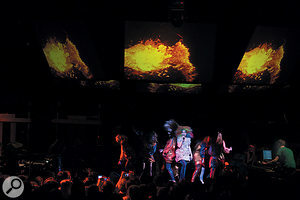 Although Björk had already composed the choir arrangements for the Biophilia songs, she had created the harmonies using the Celemony Melodyne plug-in in Pro Tools. This meant that the parts still had to be translated into a set of scores for the choir, and it fell to Matt to do the transcription. "I transcribed those vocal lines for the choir by listening to the audio,” he explains. "There is a button in Melodyne that says 'Save Audio to MIDI', but it is such a pain that it's really not worth the effort. It can't quite handle the complexities of the human voice. For example, it will pick up the intake of a breath rather than the start of a note, and if you do a swoop up to a note it gets a bit confused with what the note is. Quite a lot of the time a vocalist will naturally do all of these pitch variants, and if you are notating music you'd never put them in. And with rhythmic stuff, although a singer might be thinking of four quarter notes in a bar, they'll never actually sing it like that. During the rehearsals for the show the team realised that they needed a musical director to work out which aspects of the music were going to be played or sung live by the stage musicians, and which parts were best dealt with by MIDI sequencing and audio playback, and Matt took on the role. The first problem Matt and the team faced was how to get Manu's drums to sound like Björk's records, which often featured very processed sampled sounds that varied from one album to the next. "A lot of her songs are very electronic-beats oriented, and some of the older stuff like 'Joga' or 'Bachelorette', from the Homogenic album, for example, have really iconic electronic drum patterns, but she was very keen that things were played live and there was a live feeling to things,” insists Matt. "We were faced with the challenge of getting multitracks that are 10 years old and chopping up one stereo drum stem that contains 15 different sounds Here you can see the 'gameleste' (a celeste fitted with a MIDI gamelan) on the left, and two pipe organs used for the Biophilia tour.Photo: Carston Windhorst into meaningful one-shot samples that Manu could play. "All of us had a go at extracting the sounds. Manu was working with a guy called Curver Thoroddsen, and they spent a lot of time snipping out tiny sections from the multitracks. Then it became Manu and I. When asked if it would have been easier to find the original instrument and then add the relevant sound processors, Matt admits that the idea had occurred to them, but proved more difficult than extracting the relevant sounds from the finished audio tracks. "The more we thought about it, the more complicated it seemed. A lot of these things were done in the '90s, where it was just a MIDI sequencer spitting out information to a bunch of samplers, and that would get mixed on an SSL on the way to the tape machine, so the original sounds just didn't exist. We might have been able to find an old SCSI drive with the sample on it and then an Akai S1000 to play it on, but we wouldn't have any idea of the kind of processing that it went through after that, so the simpler way seemed to be to work with the audio file because all the information is in the file somewhere. We just needed to find clever ways of extracting it. That was done with a combination of phase reverse tricks and sometimes creating new samples that sounded like the origial. A lot of the time it was an 808 or 909 with some filtering on it, and you can get pretty close with some new samples and filters. 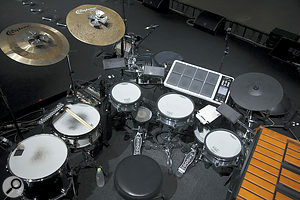 Having extracted their samples from the multitracks, the team found that one of the reasons the records sounded a certain way was because there were countless processing tweaks being applied as the tracks progressed, so one of Matt's main stage performance roles is processing Manu's drums, in an effort to recreate some of Drummer Manu Delago's percussion setup comprises a mix of acoustic and electronic drums and, visible to the right, a Xylosynth.Photo: Matt Robertson the dynamic real-time changes that were used in the making of the studio recordings. "There are tweaks to filters, reverb sends, delay sends, the decay time on an 808 snare drum, and things like that,” explains Matt. "They are things that you'd have as hands-on controls on the machines that they were using at the time, like Akais, Sherman Filter Banks, 808s and 909s. "So the V-drums are triggering a Muse Research Receptor, which has a huge bank of samples, then out of the Muse Receptor there are three stereo sub-mixes of the drums — a low, a mid and a high — and those go into my computer, which lets me tweak those stems in various ways. Then that goes off to FOH. The feed I get changes on a song-by-song basis, but to all intents and purposes I get his individual drums. "I have a different Ableton Live session for each song, so, depending on what that particular song needs, it will have different inputs open and they send to different places. For the song 'Joga', for example, I use filter controls, reverbs and delays and I have various way of doing it. I have a JazzMutant Lemur, which is a precursor to the iPad and has a touch-screen that lets you build custom control surfaces. So you put a fader here, an X-Y thing there, and a pot somewhere else; you assign them all CC numbers and that becomes a control surface for whatever you assign to it in Ableton. Matt's colleague, Paul Eastman, is in charge of the MIDI network, manning a playback rig from an off-stage position. The rig functions as the master MIDI and timecode clock source for all of the audio and any video content that is locked to the songs. 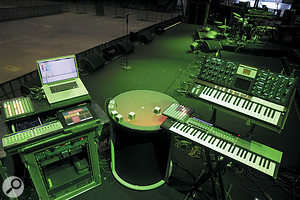 When Paul presses play, timecode is sent to the video projectors, MIDI clock to Matt's Ableton rig, and the click track, when there is one, to Manu. It also sends MIDI program changes to Matt's keyboards so that all the song-specific patches are recalled. Paul's rig also includes the Muse Research Receptor that stores all the chopped drum samples. 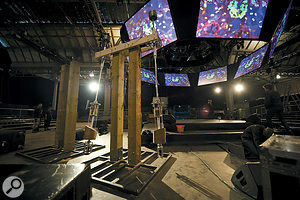 Björk herself uses an iPad to trigger some of the instruments for a number of songs, and Paul controls the routing of those devices, swapping between Logic and Ableton sessions in the set. There is also the occasional sound and backing vocal effect from audio playback, and in one song the playback rig runs an audio-to-MIDI plug-in that takes a frequency-gated signal from Manu's hang drum and turns it into a kick! 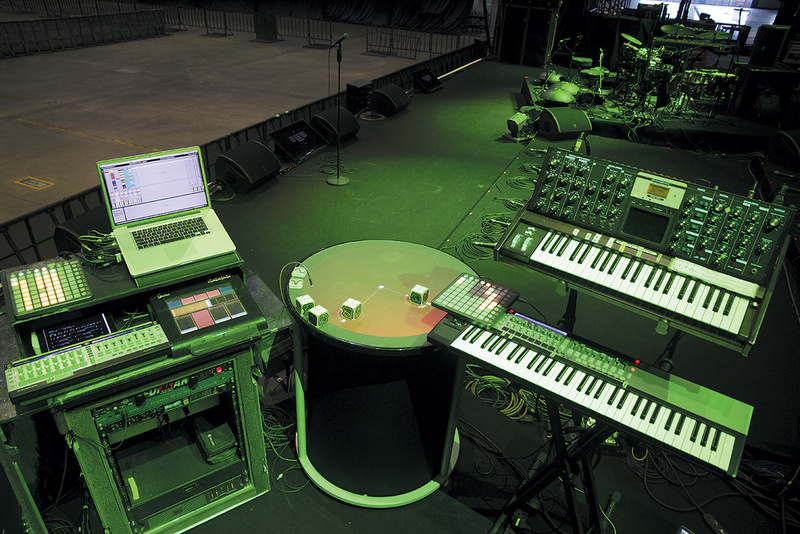 Matt's own rig is centered around a single Apple Mac Laptop feeding into a MOTU 828, which receives a master MIDI clock from Paul Eastman's rig. A Mackie 1604 mixer is used to sub-group Matt's Ableton output for FOH, and also functions as an analogue master fader that he can pull down if something goes wrong. In terms of keyboards, Matt has a Novation Remote 61 MIDI controller and Moog Voyager. The Moog Voyager is used for the majority of the bass line parts and as a stage synthesizer, whereas the MIDI controller plays the Tesla coil and triggers key samples that are running in Ableton. "We had a Dave Smith PolyEvolver Keyboard, but that has been replaced with a Novation Remote 61, so that's the main MIDI controller,” explains Matt. "And then there is an uninterruptable power supply in that rack. It's a backup, but also if you are doing festivals and you are on a little riser and you want to roll back to the stage you can keep your power going. According to Matt, it is also possible to set up complex sound and effects chains by placing various blocks in series, working from the outer rim towards the middle of the table. Then, whatever signal arrives at the middle is sent to the speakers. What's more, once a block is placed on the table, a touch-sensitive light circle appears around it, allowing the sound characteristic to be altered. "If you grab the circle that's around a delay line, for example, and move your finger, it will change the mix or the feedback of the delay,” says Matt. "I've taped some paper notes that relate to a structure in the song onto the blocks so I can remember what's what. It's similar to Manu playing the drum samples in that, musically, it doesn't bear any relation to traditional instruments like piano, keyboard and guitar, and it's all slightly arbitrary, but at the same time that makes it a really cool creative tool because you don't have that baggage of 200 years of Western music. I think that's why Björk really likes it; she's always trying to be more experimental with compositional techniques. "On one song I play the Tesla coil from the Reactable, because you can assign a sine wave to a block, and if that goes to the output of Ableton, and that goes to the Tesla coil, then you can play the Tesla coil with the Reactable! I also have a Unitor 8 in my rack and that is the MIDI interface for the Reactable. Although Matt processes Manu's drum feeds for the songs that have very specific sample sounds and effects, there are other songs in the set where he is playing instruments like the Tesla coil or Reactable, and then the drums go straight to FOH. 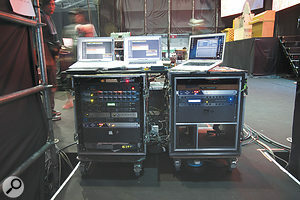 In fact the routing of audio around the stage and to and from FOH often differs dramatically from one song to the next. 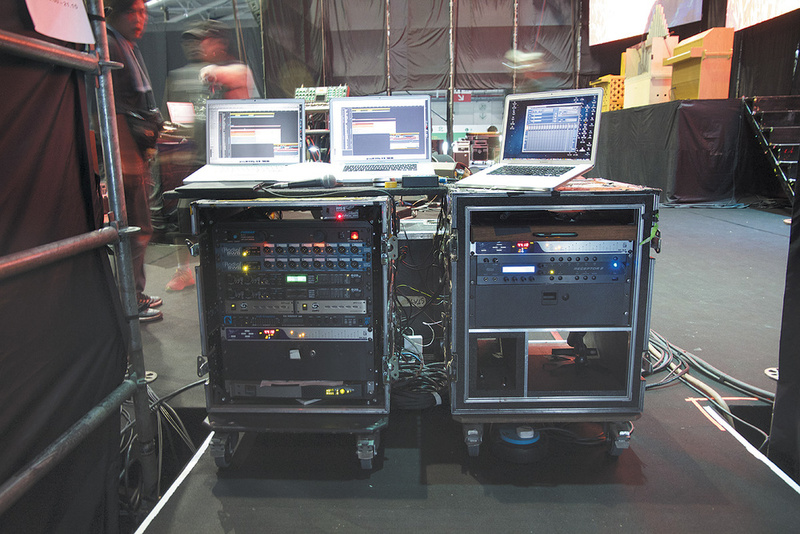 To cope with the routing changes, including those enabling Björk's iPad performances, FOH engineer Dave Bracey and monitor engineer Manu Goodwin both use Digico consoles (the SD7 and SD8, respectively), which allow them to recall different setups on a song-by-song basis. "Sometimes Manu's drums come through my system and then to FOH, and sometimes they go straight to FOH and my system will be doing something totally different,” says Matt. "It is fiendishly complicated, but before every show we do a line check on every routing possibility. That checks that the cables are plugged into the right place and the digital routing is correct. Fortunately, we had the luxury of a good three to four weeks pre-production in a rehearsal studio with all the people there, including FOH and monitors. "But within the context of the show it is about people being really on it, and making sure that they open the right session, grab the right MIDI controller, hit the right drum pad and push the right fader. If all of those things happen then everything comes out of the right holes. These days, Matt is based in Brighton, where he has his studio, but he cut his teeth working at London's Strongroom Studios on a work placement. It was there that he met the people who would kick start his career in the industry. "I did the University of Surrey Tonmeister degree in 1996 and graduated in 2000. For my industrial placement I worked at the Strongroom Studios, and while I was there I met a couple of key people; one being Neil McLellan, who produced the Prodigy amongst other things, and the other was Damian Taylor who has worked with Björk a lot over the last 10 years. Meeting those two people set up the rest of my career. Although Matt is classically trained, he insists that he gained his arrangement skills by learning on the job, in particular, working for Bond score writer David Arnold and his orchestrator Nicholas Dodd. "Nicholas would give me A3 handwritten orchestral scores and I mocked them up with samples so they could get played as demos to the director and producer and people like that. I'd input all the note data and then edit endlessly to make it sound half like a real orchestra. VSL was the thing at the time and that was in the days when you had to have four PCs to run it on. I can open that stuff up on my laptop now! "Through that I basically learnt everything I know about orchestration and I think doing it is the best way to learn. I remember doing an orchestration course at university and being completely baffled by it and not finding it relevant. It was very academic but there was also a lack of interest on my part because I couldn't see a tangible end result. But when it has to be played to somebody really important and you know you've got to make it sound good, you put in more effort and get more out. "I was living in Hertfordshire then and in those days it wasn't feasible to scan and email a 100 page A3 score, so in the evening I had to drive to Air Studios in London where they were working, photocopy all the music for the next cue, and then drive back and work on it the next day — and I'd do that every night for a month while the scoring was going on.